If you have recently burned a CD or DVD and want a custom paper case holder, we will show you how step by step below. Instead of buying a plastic case, why not create your own unique and hand folded paper case? There are multiple ways to make a case using a simple sheet of normal paper. The most common piece of paper size is A4. Here is a paper CD case template you can print from your printer using MS Office. There are also websites that let you add the title and tracks of your CD or DVD and allows you to save the file and print it out from any computer. The best website we have found to make a paper CD case is called Paper CD Case which gives you the ability to save as a .pdf file and save and print on your computer. There are also hundreds of videos for creating a paper CD or DVD sleeve here. 01. Center a CD at the top of a sheet of paper, as shown in the image above. 02. 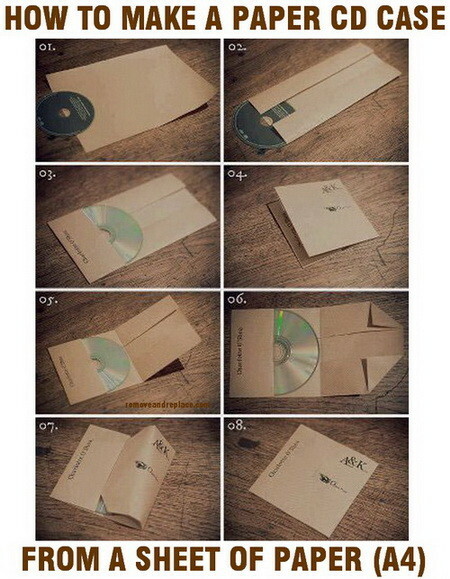 Fold in the sides of paper to the sides of the CD. 03. Then fold the CD from position 02 to position 03. 04. Fold the bottom up and over the CD until you have a square box shape. 05. Open the CD cover as shown in 05. 06. Grab the 2 corners and fold forward as shown in 06. 07. Next take the top flap portion and tuck it into the bottom of the CD case. 08. Your paper CD case is now folded shut and complete. There are also some very clever ways to repurpose old CD and DVD cases that will give you some great ideas to decorate your room or office. I am also DIY guy and like to do creative work myself. I like your creativity. CD cover is looking nice. For launching music or promoting business, we require CD’s cover in bulk quantity. Their packing can be time consuming and costly. By hiring a CD Manufacturing and Production company for bulk CD’s cover.